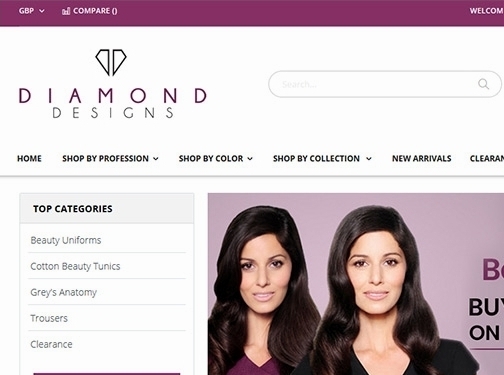 Diamond Designs are a leading work wear company. They design and manufacture luxury uniforms for the beauty and spa sector. The company has over 30 years experience in this field and as such bring a wealth of knowledge in materials and styles that are perfect for the beauty industry. They design beauty tunics and spa uniforms which are made in breathable, durable fabrics which are comfortable to wear throughout your working day. The salon uniforms they make are available in a range of styles and colours including black beauty tunics, purple beauty tunics and grey beauty tunics. In addition the supply dental uniforms and nurses uniforms. They are the exclusive distributor of the famous US brand of uniforms - Grey's Anatomy. These uniforms are scrub style and available in every colour imaginable. UK (Crossmaglen, Co Down) based business - established in 1989 - providing work wear for the beauty and spa sector. Website includes e-commerce facilities, delivery and returns information, client list, blog, associations, FAQs, full contact details.